TOMAR'S KA-BAR KNIVES-1300 HOBO Take Apart Camping Utensil Kit. TOMAR'S KA-BAR KNIVES-1300 HOBO Take Apart Camping Utensil Kit. 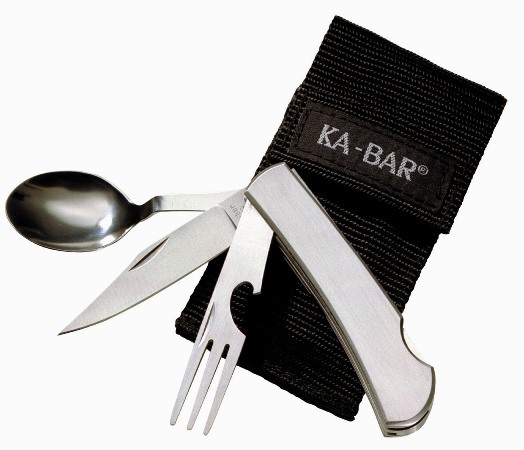 KA-BAR "The Hobo" Take Apart Utensil Kit"
Stainless steel construction handle, fork, spoon and knife mean long lasting durability and easy clean-up. Each of the three utensils uniquely slides apart and back together again to create an overall dining kit. The Hobo has an overall length of 6 5/8" when open and 3" when closed. The knife blade is 3" and has a secure lockback safety lock system and is flat ground for extended edge retention. The HOBO kit comes with a ballistic nylon sheath with wide belt loop and Velcro closure flap. The Hobo is great for on the go use, keep one in your mess kit, camp pack, glove compartment, or anywhere else utensils might become handy in an unexpected situation.